You are going to Watch Naruto Shippuden Episode 300 English subbed online free episodes with HQ / high quality. Stream Anime Naruto Shippuden Episode 300 Online English sub The Mizukage, the Giant Clam, and the Mirage. The Second Mizukage and the Third Raikage manage to escape Gaara’s sealing jutsu and battered the shinobi platoon. As the former Kages relay their strengths and weaknesses, the Second Mizukage summons a giant clam that creates a mirage. Gaara leaves the platoon to face Mu and the shinobi platoon had no choice but to fight the Second Mizukage. Onoki and Mu trade blows to each other until Gaara arrives to assist Onoki. Shocked, Gaara sees Naruto delivering Mu with his Planetary Rasengan which Mu quickly evades but with the support of Gaara, Naruto manages to land his new Rasengan jutsu to Mu. Just as Mu to be sealed, Mu utters a warning yet the sealing stops his talking. 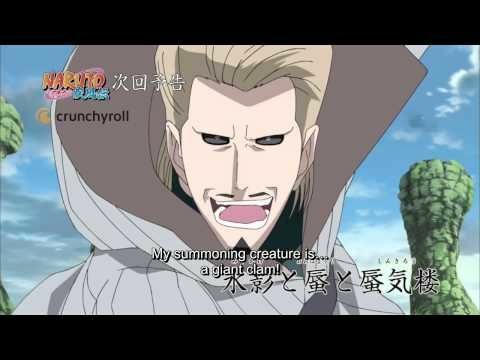 Meanwhile, the Second Mizukage argues with the platoon that they should not attack what they see him and the clam. Gaara arrives and manages to sense the location of the giant clam and Onoki delivers a powerful Earth style punch despite running low on chakra. However Onoki gets exhausted and the Second Mizukage appears on his behind with the index finger pointing at Onoki’s back. The Second Mizukage shoots Onoki with a water gun jutsu developed by the Hozuki clan.